I’ve always loved frangipani (plumeria) flowers, ever since I was a kid and my big sister had them in her bridal bouquet. So pretty and such a lovely fragrance. They don’t readily grow down south (of Australia), where I live — they’re more of a tropical plant. But some people manage, and I’ve been trying for years to get one to flower — without success. It hasn’t died, but that’s the best I can say of it. When a friend of mine moved house a few years ago, she was delighted to find an old frangipani bush growing in her garden. Several years passed but it never flowered for her. She moved it, tried planting it in a different position, but still not a bud in sight. A few months ago, in frustration, my friend ripped her frangipani out. She was about to throw it in the green recycle bin when she decided I might want it, so she stuffed it in a plastic bag and dropped it over to me. I thought it would never grow. It was just a couple of thick old sticks, no leaves and barely a root to its name. So I bunged it in a pot at the front porch and forgot about it. And lo . . . I have flowers! There they are in the photo above — only two so far, but more coming. And they smell divine. 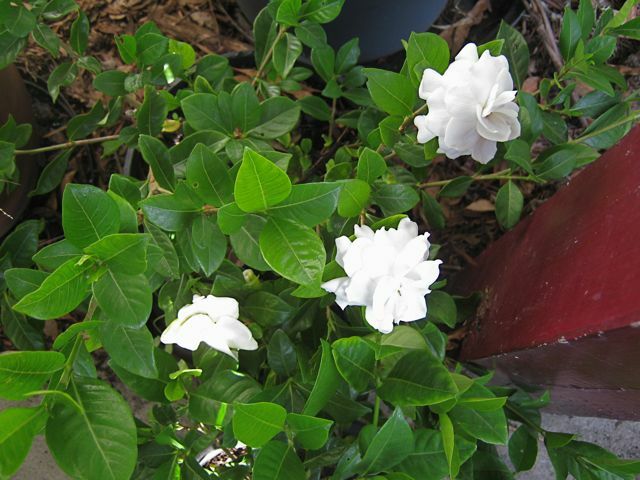 So at the moment at my front door I have a few late gardenias in bloom and frangipani. Bliss. Mind you, my original frangipani has more leaves than ever this year, but not a single bud of flower. I live in hope, though, that my new plant will encourage it. Are you a fan of fragrant flowers? What’s your favorite? Fiona, I forgot that carnations are fragrant — so many of the ones you see in the florist aren’t. Same with roses. Sad, isn’t it that fragrance is sacrificed for looks and longevity. Funnily enough, Anne, I was told by an old gardener years ago if something wasn’t flowering or fruiting, to give it a shock. He suggested striking a fruit tree with a bamboo cane for example to mimic a massive storm. The plant will think its dying and madly produce. We’ve used this idea on a non-fruiting lemon tree once and it worked but may have been coincidence. I’ve heard this, too, Ann. And here, we know when a drought is coming because all the native plants madly flower and bloom. Nature is amazing. Hi there Anne. I think the Wimmera might just be the place to try some frangipani growing. I can’t say I’ve seen any around here. Let’s not forget about Daphne for scent (my personal favourite with its lemony sweetness). Second to that would be the Blue Moon rose. A gorgeous soft mauve with the most wonderful damask scent. My nan used to have Daphne that did so well in the Chadstone area. I’ve never had any luck. I love daphne so much, Jay — such a glorious scent and just at the end of winter, too, to cheer you up. I’m not familiar with the scent of Blue Moon but it sounds lovely. 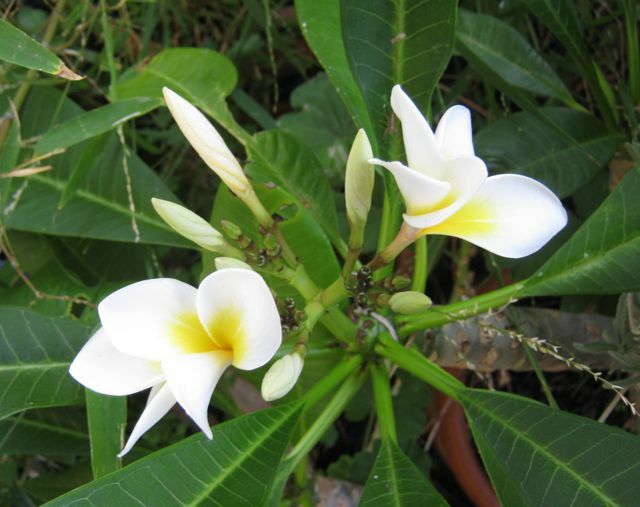 Best of luck growing frangipani.